Image map showing both lenticular phases (then and now) of the North window. Windows on Poughkeepsie was a large scale, interactive public artwork in the historic Poughkeepsie Train Station. The installation consisted of two faux windows fitted with 42 lenticular prints each. 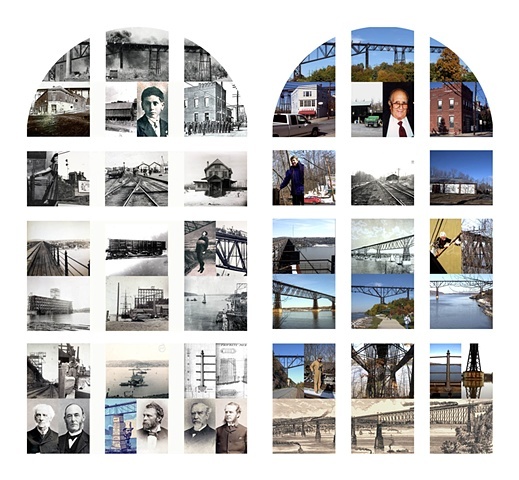 As commuters moved through the space the images shifted between past and present views of the Poughkeepsie, New York waterfront, train station and railroad bridge. Each window is over 10 feet wide and nearly 20 feet high. The project was completed in 2006 and was commissioned by the Dutchess County Arts Council with funding from the Dutchess County Industrial Develoment Agency. The artwork was removed in 2009. It was dismantled and the individual components were sold at auction, raising nearly $10,000 for the benefit of Walkway Over the Hudson, the Dutchess County Arts Council, and Locust Grove Samuel Morse Historic Site.